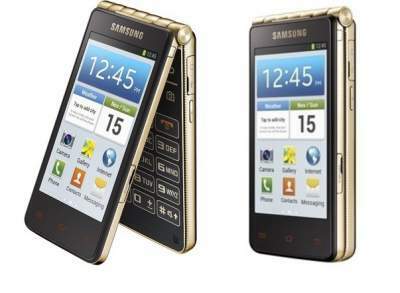 The world’s number one handset maker Samsung launched its dual flip phone, Galaxy Golden in the Indian market. Golden Galaxy is priced at Rs 51,900, which is the most expensive Samsung handsets in the domestic market. In last few years the touchscreen smart phones disappeared the flip Phones from the market. It is believed to be unique stake in the company. This phone has Dual 3.7-inch touchscreen display and users will be able to call without opening the phone. The keypad is also given. With it will be easy for people to call. The flip phone has 1.7 GHz dual-core processors with 1.5 GB RAM and runs on Android 4.2 Jellybean Operating system. This phone is equipped with internal memory of 16 GB and can be expandable up to 64 GB. The 8 megapixels camera is used on rear side and 1.9 megapixels camera on front side and The Phone is powered by 1820 mAh Li-Ion battery.